2002-06-05 Application filed by Krohn Roy C. filed Critical Krohn Roy C.
2005-02-17 Assigned to ALLIED PHOTOCHEMICAL, INC. reassignment ALLIED PHOTOCHEMICAL, INC. ASSIGNMENT OF ASSIGNORS INTEREST (SEE DOCUMENT FOR DETAILS). Assignors: KROHN, ROY C.
2007-02-08 Assigned to ALLIED GUARANTORS, LLC reassignment ALLIED GUARANTORS, LLC SECURITY AGREEMENT Assignors: ALLIED PHOTOCHEMICAL, INC.
2008-03-07 Assigned to BOJI, FRANCIS, BEAUCHAMP, NORMAN D., ALLIED GUARANTORS, LLC., KURZWEIL, CHRIS, LAWRENCE, CHARLES U. reassignment BOJI, FRANCIS SECURITY AGREEMENT Assignors: ALLIED PHOTOCHEMICAL, INC. The present invention discloses an ultraviolet light curable lubricating composition and method for making such a composition that may be used to produce a lubricating layer. The disclosed composition does not contain any significant amount of volatile organic solvents that do not become incorporated in the lubricating layer after curing. This application is a continuation-in-part of International Application Serial No. PCT/US00/42603, filed Dec. 6, 2000 which, in turn, claims the benefit of U.S. provisional patent application Serial No. 60/169,248, filed Dec. 6, 1999. The term “aryl” means an aromatic radical. Example of aryl include a phenyl group, a naphthyl group, a phenyl group substituted by 1 to 4 substituents selected from alkyl as defined above, alkoxy as defined above, thioalkoxy as defined above, hydroxy, halogen, trifluoromethyl, amino, alkylamino as defined above for alkyl, dialkylamino as defined for alkyl, N-acetylamino, cyano —SO 2NH2, or nitro, or a naphthyl group substituted by 1 to 4 substituents as defined above for a phenyl group substituted by 1 to 4 substituents. To illustrate, the following example sets forth a presently preferred lubricating composition according to this aspect of the invention. wherein the teflon composition comprises PTFE powder particles with an average particle size from 0.3 μm to 30 μm and the lubricating composition does not contain any significant amount of volatile organic solvents that do not become incorporated in the coating after the composition is cured. 2. The UV curable lubricating composition of claim 1, wherein the at least one aliphatic acrylated oligomer is present in an amount of about 10% to 45% of the weight of the lubricating composition. 4. The UV curable lubricating composition of claim 2, wherein the at least one aliphatic acrylated oligomer is at least one urethane oligomer. 5. The UV curable lubricating composition of claim 2, wherein the mixture further comprises an ethylenically unsaturated monomer. 6. The UV curable lubricating composition of claim 5, wherein the ethylenically unsaturated monomer is present in an amount in an amount of about 15% to 60% of the weight of the lubricating composition. 7. 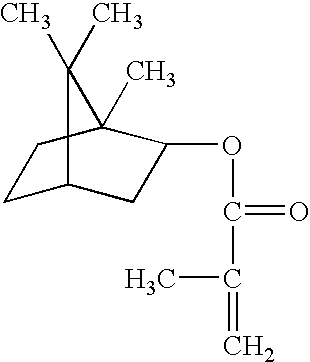 The lubricating composition of claim 5 wherein the ethylenically unsaturated monomer is selected form the group consisting of isobornyl acrylate, isobornyl methacrylate, and mixtures thereof. 8. The UV curable lubricating composition of claim 5 further comprising an acrylated epoxy oligomer. 9. The UV curable lubricating composition of claim 8 further a flow promoting agent. a flow promoting agent in an amount of 0.1% to 8% of the weight of the paint composition. mixed triaryl sulfonium hexafluoroantimonate salts, mixed triaryl sulfonium hexafluorophosphate salts, and mixtures thereof. illuminating the lubricating composition on the substrate with an UV light sufficient to cause the lubricating composition to cure into the lubricating coating. 14. The method of claim 13, wherein the lubricating composition further includes a flow promoting agent in an amount of 0.1% to 8% of the weight of the lubricating composition. the teflon composition in an amount of about 25% to 35% of the weight of the lubricating composition. the teflon composition is about 31% of the weight of the lubricating composition. 17. The method of claim 13, wherein the UV light used in illuminating impinges upon the lubricating composition so that the lubricating composition is caused to form the coating it cures. 18. The method of claim 13, wherein the method of applying the lubricating composition is spraying. 19. The method of claim 13, wherein the method of applying the lubricating composition is screen-printing. 20. The method of claim 13, wherein the method of applying the lubricating composition is dipping the substrate into the composition sufficiently to cause the composition to uniformly coat the substrate. 21. The method of claim 13, wherein the method of applying the lubricating composition is brushing. 22. The method of claim 13, wherein the method of applying the lubricating composition is selectively depositing to the substrate at predetermined locations. 23. An article coated by the method of claim 13.
the teflon composition is about 21% of the weight of the lubricating composition. US5100848A (en) * 1990-05-10 1992-03-31 Agency Of Industrial Science And Technology Oxide type solid lubricant containing Cr2 O3 and Na2 ZrO.sub.